HomeSaver put their Foil-Face FlexWrap insulation in a kit so you can get everything you need for a typical relining job as simply and easily as possible. If you use one of our HomeSaver Pro insulation kits with its matching relining kit, you'll find the insulation is cut perfectly for the liner size you order. The liner kits come in 25', 30', and 35' lengths which means you will not have to measure and cut the insulation yourself. We've covered that for you. Let's face it, the less you have to handle FlexWrap the better. As great as it is for insulating, it is not much fun to measure and cut. 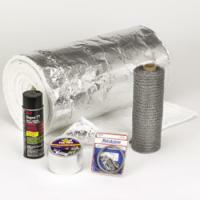 Our new HomeSaver Pro insulation kits come with 1/2" insulation. That means you only have to use a single wrap of insulation on the pipe, not the two wraps required with 1/4" insulation. Since one wrap of 1/2" gives a smaller outside diameter on the finished product than two wraps of 1/4" or one wrap of 1", you'll have even more clearance for getting your HomeSaverPro pipe down the flue. Naturally, we've got HomeSaver Pro UL Listed for one wrap of 1/2" insulation so, when you follow our instructions, you can be assured that your system is UL Listed. Now with just two item numbers (one for the relining kit and one for the insulation kit) it's possible to get everything you need for your reline, including insulation, perfectly sized for your application. These kits were made specifically for HomeSaver Pro and UltraPro and may not fit other brands of relining pipe due to differences in outside diameters. With these options, why would you even consider buying anything but HomeSaver Pro when you want a premium relining product for your chimney. Product Note: These kits are very convenient, but much more expensive than the basic individual components. If you don't mind cutting the insulation and dealing with the mess, we suggest buying individual components for your reline kit. You will save quite a bit.